Then the bell rang, and the team with the oldest players in the majors limped out to a 1-9 start from which they never recovered.? Doomed before they’d even cracked the roof at the Rogers Centre for the summer. Good people at their jobs were let go. Reasons were not really given. Explanations were not provided.? On the surface, the moves came across as petty, even mean-spirited, as in the case of visiting clubhouse manager Lenny Frejlich, one of the few charter employees with the club. They fired a bunch of long-serving back-office people, none of whom actually made baseball decisions or were tasked to hit home runs, for no particularly good reason other than they could do it. Or maybe it’s got something to do with “culture”—? a word that these days gets thrown around so often by this management team to explain away bad decisions that it’s beginning to sound Orwellian. The offseason also saw the loss of long-time Blue Jay favourite Jose Bautista, whose contract was non-tendered by management after a less than spectacular 2017 in which he hit .203. 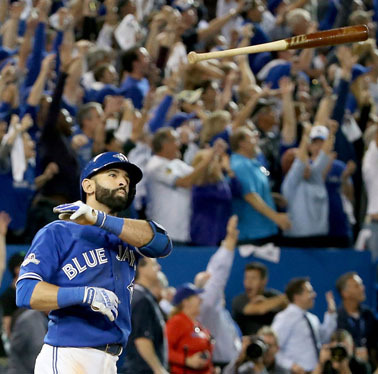 He will be remembered for thrilling Blue Jay fans for over 10 years in which they serenaded him with “Jose!…Jose!..Jose!”, highlighted by 54 HRs in 2010 and one memorable bat flip in the magical 2015 season.? A place will be made for him one day on the Blue Jay Level of Excellence. 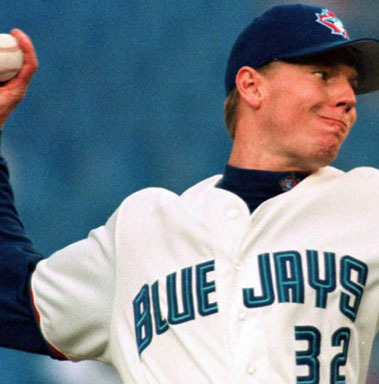 Few players have meant as much to Blue Jays fans as Roy Halladay.? During his dozen years with Toronto, the 40 year-old native of Denver posted a 148-76 record in 313 games, pitching a total of 2,046 2/3 innings and 49 complete games for the team, the most in baseball during that period. Halladay was the genuine article: a gentle, charitable soul with the most aggressive, attacking pitching style you could ever find. 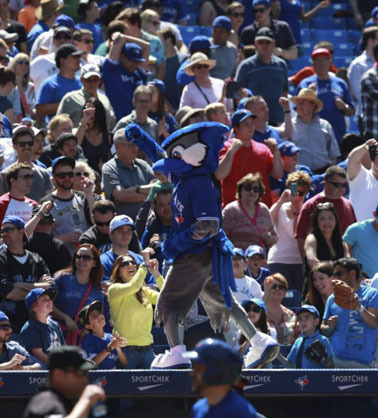 Roy loved Toronto and Blue Jays fans, in the stadium, around the city and across the country. He loved them for the way they respected his privacy when he was out in public with his family. He loved them for the reaction to his huge charitable contributions led by Doc’s Box, with the Hospital for Sick Kids.? 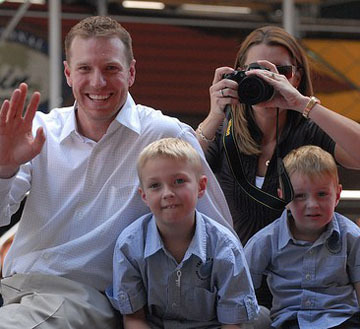 Many of those stricken families stayed in touch with the Halladay’s when they headed south. Halladay would go on to pitch for the Phillies from 2010-2013, amassing another Cy Young award in 2010 while pitching only the twentieth perfect game in Major League Baseball history.? He would also go on to pitch the first post-season no-hitter since 1956; yet his goal of pitching in the World Series would sadly elude him. The Toronto Blue Jays head into their third season under president and CEO Mark Shapiro on unsteady ground.? Perhaps more so than any other team in the major leagues in 2018, the Blue Jays are its most confounding team.? Posing the question; will the Blue Jays contend or continue to regress further gutting the team that went to the post-season in both 2015 & 16. This then is somewhat of a team in limbo, your classic middle-of-the-road team, which is the worst place to be these days when your position on the win curve drives everything.? Since arriving here, Shapiro and Atkins have preached youth and done the opposite thing. They’ve talked about building up depth in the minor-league system, which is still a desert. They’ve made no substantive new roster commitments to a team that had just recently made the postseason two years running. Quite the opposite, whenever possible, they’ve let the most expensive high-end talent leave such as Edwin Encarnacion in 2016 and Jose in 2017. And now they’re poised to let Donaldson walk in 2018. Shapiro has done two full tear-down rebuilds during his tenure in Cleveland. He calls those times the “blank-stare period.”? “You believe in what you’re doing, but everybody around you gives you the blank stare.”? He further went on to say the real impediment to fixing the Blue Jays is their customers.? “I’ve said all along, if we were just running our team without fans and it was an intellectual exercise, we would’ve hit a reset over a year ago”.? Thus, after two years of holding course, Shapiro’s team may not yet be in that reset territory, but the Jays wagon train is headed there. That will enrage some people. This sort of course, the middle way, the maybe-things-will-turn-out way led the Jays into two uninterrupted decades of mediocrity.? But the Jays are somewhat stuck in this model for financial reasons.? Though a loser last year, Toronto still drew substantial crowds (over 3.2 million fans was most in the American League) and still had healthy TV numbers (averaging in the neighbourhood of 800,000 viewers a game). The club knows from experience that support and interest will evaporate if the team is publicly seen to be giving up. So waving the white flag is a non-starter from ownership’s perspective. 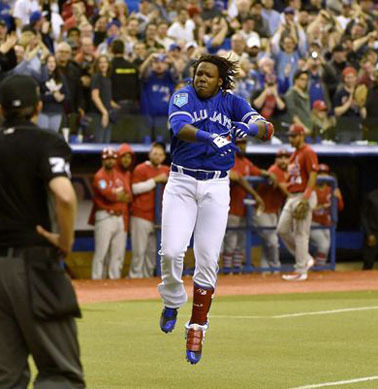 At some point, the Jays will have to jump from “win right now” to whatever’s coming next. If so it’s going to be a considerable distance —? perhaps a couple of depressingly mediocre years at the very least. But no one in the Jays corner suites is ever going to say the word “rebuild” in front of a microphone. There are many millions of reasons not to. Perhaps the most vexing question is how precipitous the fall was from the heights of 2015 when Toronto was an offensive powerhouse and led the league in most hitting categories.? Last year the Blue Jay offence was dead last in the American League scoring only 693 runs despite playing in a hitter-friendly park. And this was compounded? 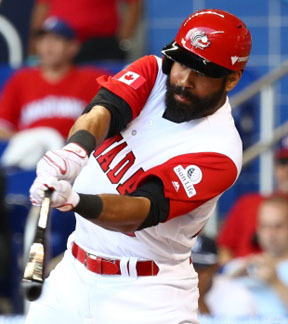 further by letting runs- scored leader Jose Bautista (93) walk in the offseason. For years, the Blue Jays, sporting an older slower lineup placed an predominate and increasing emphasis on the home run to produce runs.? This was somewhat exposed last year as the homers dried up and their station-to-station approach, along with the lack of clutch hitting with runners in scoring position, left them struggling to put crooked numbers up on the scoreboard. It’s likely to be better than last year, it can’t be worse.? 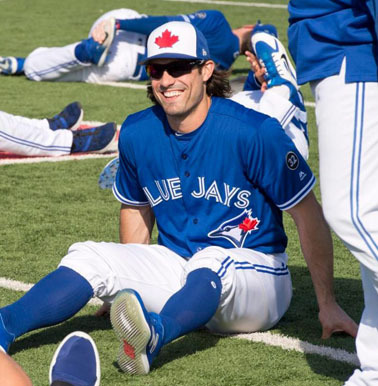 The Jays traded for Randal Grichuk to replace Jose Bautista in right field, and acquired infielders Yangervis Solarte and Aledmys Diaz to replace the light-hitting duo of Ryan Goins and Darwin Barney.? The Jays will also look to a rejuvenated and healthy Devon Travis to be a spark plug at the top of the order and play a greater role in generating offense. With all that said, the lineup looks to be a shell of its former self, populated with aging veteran players (Troy Tulowitzki, Kendrys Morales, Russell Martin, Curtis Granderson) who all have seen better days and look to be on the decline.? Is it enough going to be enough in the AL East with the stacked Yankees and Red Sox?? Probably not, which will put further pressure on the pitching and defence to keep them in games. After leading the American League with an ERA of 3.78 in 2016, the Jays pitching staff slipped to seventh last season as their collective ERA ballooned to 4.42.? Much of the fall stemmed from the starters, who were dogged by injuries for much of the year (the Jays had to use a club-record 14 starters), and a bullpen that ended up throwing a team-record 596.2 innings, the most in the major leagues. The good news is that the rotation appears to be much healthier this spring.? 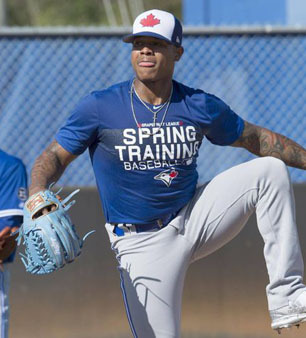 The only issue was Marcus Stroman who was temporarily eased into spring training because of shoulder inflammation, but who is slated to begin the season with the ballclub.? For additional insurance, the Jays also added former Yankee Jaime Garcia late in the spring to be their fifth starter. “I don’t think it’s a stretch at all,” said GM Ross Atkins when asked if the rotation can lead his team back to respectability. “If you have the Aaron Sanchez of 2016 and the Marcus Stroman of 2017 it could be even better. That would be an incredible outcome and something that I could see happening.”? Much though will rely on the precarious hand of Aaron Sanchez. The 2017 season was supposed to be the year that Aaron Sanchez was finally unleashed from any restrictions on innings or pitch counts and become the ace of the staff. Instead a combination of blister, fingernail, and eventually tendon issues held him to just 36 innings pitched en route to the most frustrating season of his career. He hit the disabled list on four separate occasions and couldn’t get past the issues he had with his pitching hand.? Sanchez ended the year 1-3 with a 4.25 ERA, a far cry from a breakout 2016 campaign that saw him lead the AL in ERA (3.00) and win percentage (.882). 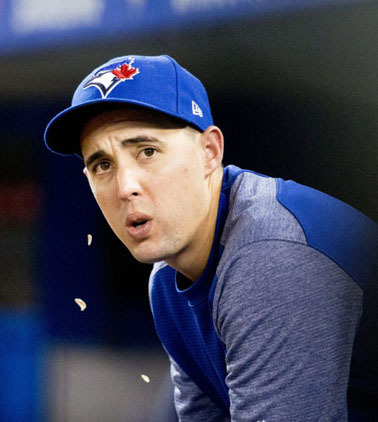 Based on everything that the Blue Jays have said, Aaron Sanchez has thrown with none of the blister-related issues this spring.? His fastball has been sharp and he’s talked of adjusting his grip in order to avoid blister issues. “The good thing is, I didn’t forget how to throw,” the 25-year-old California native said with a shrug and a grin. Yet until Sanchez pitches in a regular season game the Blue Jays won’t know for sure how his finger responds to high-stress environments. Until he strings together a few starts they won’t know whether repetitive strain creates complications. “If Sanchez stays healthy, he’s a key, key part of this team,” Jays manager John Gibbons said. “We need him out there. Basically it was a lost season last year and that’s never easy at this stage of his career but it also means he has a fresher arm, too.”? ?His talent is undeniable, and if he can perform anywhere near the way he did in 2016 then the Blue Jays are very well set up in the rotation, both in 2018 and going forward. As mentioned, injuries to the Blue Jay starters left the bullpen taxed through much of last season throwing a team-record 596.2 innings, the most in the big leagues.? This translated into 26 blown saves (including a league leading 10 from Roberto Osuna) that were tied for last in the AL, with an ERA that was eighth in the league. 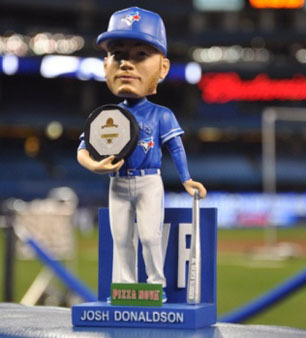 In many ways the plight of Josh Donaldson will be the Blue Jays canary in the coal mine.? In the offseason they signed him to a one-year, $23-million deal for 2018, but did not negotiate a contract beyond this year. 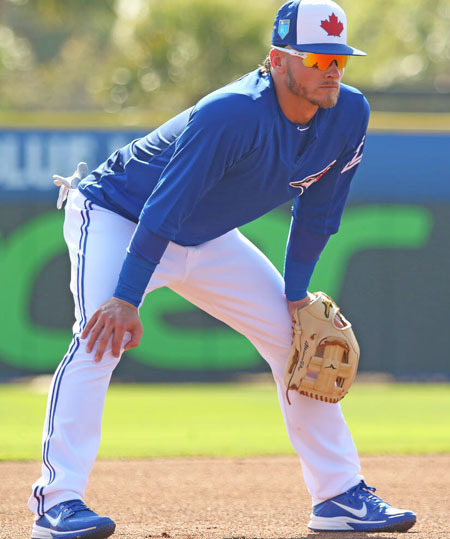 Josh Donaldson stated in the spring that the sides do not see “eye to eye” on a long-term deal, and after shutting down contract talks expects to become a free agent next offseason. This places a huge emphasis on the early season success.? If the Blue Jays start out poorly once again, he could become the first domino that falls either before or at the summer trade deadline.? 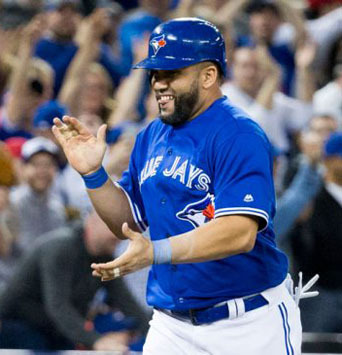 And this could signal that the team is changing course and will be primed to unload other veteran players, turning the page in order to rebuild with younger players and the next generation of Blue Jays. The Blue Jays hope to bounce back in 2018 from their first losing season in four years with a core of the team that returns pretty much intact from a year ago.? Even with dramatically improved depth and health, though, for the Blue Jays to eke one last playoff push out of their current competitive window, they have to get off to a strong start — something they’ve consistently failed to do in recent years. Over the past five seasons, the Blue Jays have managed a ghastly 52-74 record (.413) in April, and their early-season woes reached a nadir last year when they dropped 11 of their first 13 games and didn’t come within 4 1/2 games of first place in the division after April 12. Club president Mark Shapiro is already on record saying that season ticket totals have dropped over 35% from 20,000 to 13,000 for this season and you can bet there will be an indifference among the traditionally strong walkup crowd until it is convinced there is something to buy.? 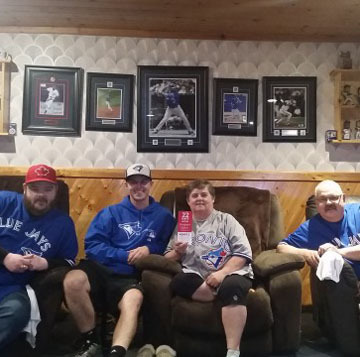 The loyal audience that flocked to the dome during the magical 2015 run, and who have led the league in attendance over the past two years, produced huge revenue for Rogers Communications, much of it based on the good faith that the team would continue to push for playoff contention. That loyal audience had also put up with an increase in ticket prices for three consecutive seasons and then were asked to pony up yet another for 2018 — as high as 17% in some categories — despite last year’s wildly disappointing season. Since the end of last season Shapiro has; raised ticket prices, altered the way in which mini-packages are sold, complained that the stadium isn’t financially workable, and said that the Jays can’t compete with the Red Sox and Yankees unless there are major renovations done to the Rogers Centre, a building his team happens to own.? Yet as former club president Paul Beeston used to say, “no one really wants to hear about what the Jays can’t do”. With the Yankees and Boston Red Sox loading up, and the perception that the Jays brass hasn’t done enough to stay with them, don’t be surprised if fans sit on their wallets until they see what the Jays have.? In the meantime, a veteran-heavy team that has come to appreciate the big dome crowds of the past few years may be in for a surprise early in the season at the place they once called the Skydome. Tags: Đặt cược miễn phí ngay bây giờ 2019Aaron Sanchez, Đặt cược miễn phí ngay bây giờ 2019Baseball in Canada, Đặt cược miễn phí ngay bây giờ 2019Blue Jays 2018, Gregg Zaun, Halladay, John Axford, Jose Bautista, Josh Donaldson, Lenny Frejlich, Rob Sparrow, Roberto Osuna, Vladimir Guerrero Jr.